Looking for information on harvesting and preserving herbs? 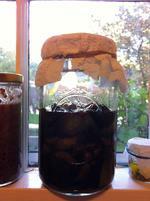 Interested in tincture making, teas and other natural medicines? Here's a compilation of info I've discovered in books in the last 2 years. I used New Holistic Herbal by David Hoffman (which I highly recommend). I must use this book at least once a day. At the bottom of this post I include a list of all the books I used but this one is by far my fav! First of All; Why Herbs? Herbs are readily available, inexpensive and they work! They can be found in your back yard or purchased from a health food store. They have a gentle action on the body which differs from pharmaceuticals. Herbs are food! You wouldn't worry too much about ingesting too many apples, would you? And if you did, you'd know it- because you'd likely be in the bathroom for a while! Herbs are nutritive, support body systems, have actions such as astringency, anti-bacterial, anti-inflammatory and much more. They can be injested in teas, tintures, and capsules. They have been used (some) for thousands of years and proven over and over in thier efficacy. Many of them are now being proven by science, but our forefathers and mothers knew of thier ability to nurture our bodies, heal our wounds and off-set many common and not-so-common ailments. They used herbs in cooking, teas and in poultices- Even on battle fields!. All learned by trial and error! And for that~ I say THANK YOU to each of them that blazed a trail for the modern herbalist. How Can I Use Herbs & How much do I use? Tinctures should be taken according to weight. An adult can take 20 drops 3 times daily. If a child is a quarter of the weight of an average adult (say 20-40lbs) 5-10 drops, 3 times daily would be fine. Teas: Use a tea pot, tea ball, tea bags or just boil water in a pan, remove from heat, then add herbs. Use as much as you like but a general rule is between ⅛ and ¼ cup dried herb per 48oz. This will make a nice strong brew which will allow you to experience the herb. If you find that this is too strong or you don’t care for the flavor- experiment! Use less, or more, add honey, or even a little stevia. Use less of herbs like Catnip that don’t taste good and more of others like Peppermint as they are palatable for kids. At the onset of cold or flu, give therapeutic doses to children and adults every few hours the first day. The second day take the normal Therapeutic dose. How long do I steep the herbs? Steep a nice strong brew for an hour or two. At the very least steep the herbs for 15 minutes so that the water has time to break down the herb. You may steep your herbs for as long as 4-5 hours. If your just adding herbs to a pot of water, strain herbs out with colander or mesh strainer and serve hot. Ideally a teapot or tea infuser ball is used. Add ice for iced herbal infusion. What time of year should I pick my Herbs? Each herb has it’s ideal harvest time and medicinal part of the plant. Many of them that come into flower should be picked just before or during flowering. Roots as a general rule should be picked in fall or spring. For more information the book, “The new Holistic Herbal” by Hoffman explains it all and more. What time of day should I pick my herbs? They should ideally be picked when the morning dew has dried from the plant. Especially when your going to dry the herb. This will ensure that the herbs don’t mold. Late morning to early afternoon is best. If you are continually harvesting yours (as I do) plants won’t flower as quickly; then you can enjoy a longer season as they wont go to seed as fast. Harvest herbs where you know that NO chemicals have been sprayed (at least in the last 2 or 3 years). This will ensure the best quality plants for your kids and your family AND you’ll make potent medicines from healthy soil. Yellow Dock that I will split, chop & dry by laying on a plate.HOW do I dry the herbs? When you dry herbs, hang them in a well ventilated area out of the direct sunlight. Clump them into bundles and wrap a rubber band around to secure the ends. Try not to do bunches bigger around than about a half dollar where the rubber band holds them together. This way it can dry all the way through. This is true for all the herbs you dry with a few exceptions. **If they brown, they have lost some of there oils negating the medicinal properties. Throw those away. Fresh is always best but dry is a great way to preserve for the entire year. When you pick a fresh herb try to use it the same day, either by drinking in a tea, eating in a salad or making a green drink from it. Remember Dry is ALWAYS more potent then fresh. Fresh has more water so it is LESS potent. These are by far not the only herbs that you can add to the list! Any herb that is listed as astringent, demulcent (soothing), vulnerary (healing), anti-inflammatory, analgesic (pain relieving) are useful in ointments, oils and balms. Experimenting w/ lavender & chamomile infused w/ coconut oilMaking Herbal Oils: Here’s what you need! High Quality Oil such as olive oil, grapeseed oil, jojoba oil, or even coconut oil. Herb fresh or dry which has been cut and chopped. Make sure your oil is liquid (coconut oil is a little difficult because it hardens so easily, if you are going to use coconut oil, keep it in a cupboard next to the oven or heat duct so that it remains warm-ish. Combine enough oil and herbs so that the oil completely covers the herbs. All herbs must be saturated. Use a spoon to push down the leaves or roots into the oil, the idea being that you want to eliminate as many air bubbles as possible. Try to do this everyday or at least several times a week. Allow oil to infuse with herbs and roots for at least one month; I usually wait two months to be thorough. Once the infusion has sat for 1-2 months, it’s time to strain the oil. Using a funnel with a strainer built in (ideal), pour oil and herbs through funnel catching herbs in strainer. You can use it just as it is OR you can add beeswax to make it more of a salve to ointment mixture. Add essential oil of peppermint, tea tree or lavender to scent the oil if you desire. Example herbs to use are: St. Johns Wort, Calendula Flower, Chamomile Flower and Plantain Leaf. **Oils are an effective way to get a medicinal plant into the affected area of the body needing healing. Once the wound is closed up and scabbed over, oils work wonderfully to heal the body faster. All you really need to make a nice ointment or salve is your oil infusion (oils infused with herbs for 1 to 2 months) and some grated beeswax. I like to use a small Pyrex bowl on my hardtop electric stove. If you have a gas stove, you may need a small pan to warm it in on the stove instead. I like using the glass because it’s seems easier to clean when your done.Warm the oil on the stove about 2 minutes. Add shaved beeswax. My rule is you want to add about a quarter of the total amount of oil used in beeswax. So, one cup of oil= ¼ of beeswax. Continue to gently warm the oil until the beeswax is completely dissolved and remove from heat. It’s time to test it! : Tear off a small piece of wax paper or parchment paper and add 1 drop of oil to the paper. Put this in the freezer for 25 seconds. The oil should solidify, if you touch it, it should feel like the texture of anywhere from ointment to lip balm. It really depends on how firm you want it. Add more beeswax until you get the desire consistency and store in a glass sealable container. Example oils to use are: St. Johns Wort, Calendula Flower, Chamomile Flower and Plantain Leaf. **Ointments are great because they are convenient, portable, and effective for treating wounds, cuts, gashes, scrapes, bruises, trauma, rashes, abscesses, bites, stings and more. There are many ways that you can do it, with cloth, flannel, water, even spit! If your outside and you have no other option and you’ve been wounded, stung or bitten by something, you wouldn’t be above chewing the herb up to make a spit poultice, would you? I’ve done it many times- especially for bug bites. The idea is to bruise, grind or mash the herbs and add hot water to soften them further. Create a mushy mass of the herb and water. Apply cotton from an old t-shirt, flannel or muslin cloth or cheese cloth to the affected area. Plop the mass of herb and water down onto the flannel or cotton. Add another piece of cotton over the herbs making an “herb sandwich”. Roll the bottom piece of the cotton up over the top so the herbs don’t ooze too much out of the cloth. Place a plastic grocery bag over the herb sandwich and then ideally a heating pad or hot water bottle. Be sure to change the poultice ever hour if there is infection in the wound as pus will be drawn out into the herbs. Examples of poultice herbs are chickweed, plantain, comfrey leaf and/or root and chamomile. **Poultices are effective way to treat wounds, gashes, scrapes, abscesses, rashes, bites, bruises, stings & more. First of all you have to know what kind of herbs you want to preserve. I would really recommend picking up the “New Holistic Herbal” by David Hoffman for a great start on info there. There are several books I can recommend so if you’re looking for a “fresh” herb book- let me know! The herbs I demonstrated in class were St. Johns Wort and Passion Flower. I am happy to point you in the right direction if you want more info on these herbs or what they support the body in. Just reach out! 80 proof vodka & medicinal herb: most herbs make great tinctures with few exceptions. Glass canning jars- always use glass! If the herbs are DRY- you may cover them with vodka and put a lid on it; shake it at least 1 to 3 times per week to agitate the mixture. If the herbs are FRESH (as in you just picked them!) cover them with vodka and use a paper towel to cover with a rubber band. This allows any water that is in the plant to evaporate out. Water is the enemy of herbal preserves because it will encourage mold. With FRESH herb tinctures, stir the concoction at least 1 time per week to agitate the mixture. Any 80 proof vodka will do- but if you can get it, use Ever Clear.How Long do they steep in the vodka? For leaves like Red Raspberry, Nettle, Oregano etc. ; soak in vodka from 2 to 4 weeks. May be done as long as two months (as I have done this many times with success). For Barks like Pau D’Arco soak in vodka from 6 to 8 weeks. They need more time for the solvents to break down the plant matter. For Roots such as Valerian Root or Dandelion Root, soak in vodka for 6 to 8 weeks as well. While they are not as “tough” as roots they are still thicker than leaves so allow more time to steep. Use the fine mesh strainer as I demonstrated in class to strain off the herb from the liquid. Use the herb for compost and store the liquid tincture in glass in a dark cupboard that is NOT exposed to heat, light, or electromagnetic frequencies. (routers, computers, etc). Get tincture bottles and use funnels to put in tincture bottles. They can be stored out of sunlight, and heat indefinitely. Vodka doesn’t go bad! The standard cost for liquid herbal tinctures is approximately $10 per ounce. You can sell them for whatever you like! Herbal Tips & recipes: How to get your kids to ingest herbs! Hot bath soak with herbs in the water (absorbed through the skin) This can however stain the tub a bit...nothing that a little baking soda and a scrub brush wont fix! Chamomile tea sweetened with honey or stevia. Served hot or cold. Take chickweed, chamomile, and plantain and put it in a blender with water. You can also strain the pulp out for cleaner cubes. 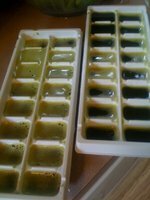 Liquefy completely and pour into ice cube trays and pray you never have to use them. Can be used directly on cuts, scrapes and even gashes on the way to the emergency room. Also can be used for pets! Chop up 3 to 5 mullein leaves and put them in a glass jar. Pour local, raw honey over the mullein and stir. Let the mullein sit in the honey for 4-6 weeks to pull out all the medicinal value of the plant. The longer the better. Make sure to stir it every day as the herbs will rise to the top. Rosehips, Coltsfoot and White Horehound make great additions. Strain the herb that rises to the top after 4 weeks, use this herb to make an herbal tea! -tasty! Adults take 2 tsp every 3 hours for cough; kids half that amount. In July or August begin harvesting mullein flowers. chop up 1 clove of garlic and add this to the flowers and olive oil. Stir at least once a week. Make sure no flowers stick out of oil so they don’t mold. Strain out flowers and garlic - it will smell strongly of garlic! Directions: For earache, warm oil in it’s container in the sink or in a bowl of hot water for 5 minutes. Check oil temperature on your forearm before application. Put 2-4 drops in the child’s (or adults) ear. Place cotton in ear and lay with affected ear up to ensure penetration of oil. Heating pad and white willow bark for pain is recommended. More oil may be added every 4 hours or so. If accompanied by fever use belladonna 30c. This was my first real herbal book. It tops the list because cover to cover it’s a great read, it teaches you how to make medicines at home and it’s the herbal book that I still use most. This was a book that I got through school but if your looking for information on the physical action of herbs, their constituents and the exact mineral make-up of herbs, this is the book for you. This book has MANY more herbs listed than the New Holistic Herbal. This is a real live folk herbalist! Her recipes and folk uses are interesting and helpful. I like to have 3 good herb books that way if I get conflicting info I can compare to get the best answer to my herbal inquiry.